Look inside the October 2016 Issue for these and other features! As you may have noticed in last month’s issue, October is American Archives Month. Every year, we focus on a different aspect of the archival craft, and this year we are focusing on the role of archives in preserving historic properties. 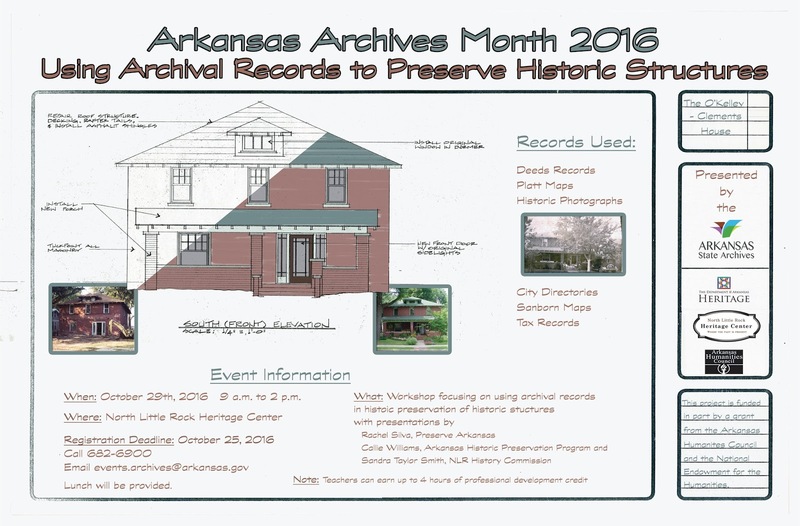 The Arkansas State Archives holds a wide variety of resources useful in researching and documenting private and commercial structures around the state. The past twenty years have witnessed a revitalization of many of Arkansas’s historic downtowns. What were once neglected and blighted areas have been restored to bustling commercial and residential areas. Many Arkansas downtowns have been helped by the Main Street Arkansas program, part of the Arkansas Historic Preservation Program at the Department of Arkansas Heritage. The ASA has a collection of architectural drawings created by the Main Street program. On October 11, 2016, residents in and around Little Rock held a collective breath. The work in offices ground to a halt as employees gathered around computers; shoppers at malls stopped to stare at the tiny screens of their cell phones; and those at home found themselves glued to their television sets. They waited in rapt attention for the demise of one of Little Rock’s most historic landmarks, the Broadway Bridge. American Archives Month is a great time to raise public awareness of the important role that record-keeping agencies play in our society, as well as the necessity of preserving records, historic and official. Records, and the repositories that preserve them, provide us with a connection to our past, both on a personal level and collectively. Preserving records that document the work of our government — city, state or federal —protects us as citizens and promotes transparency among public officials. Since the 1880s, Eureka Springs has been a destination for Arkansans hoping for a nice restful vacation. When their vacation is over, holiday goers pack up their souvenirs and hit the road, saying goodbye to what some early advertisements referred to as the Switzerland of the Ozarks. While the vacationers leave, there are some who stay behind. Perhaps forever, if one is so inclined to believe in ghosts. People have told stories about the “haints” that populate the Ozarks; and one of the focal points for many of these stories is Eureka Springs’ grand hotel, The Crescent Hotel. The hotel certainly has a history that might lend credence to many of these stories. It has served as a hotel resort, a school, a hospital, then a hotel again, each stage in its history leaving a mark upon the folklore of the town. Perhaps the best way to begin the story is to talk about why Eureka Springs exists at all. Unlike other towns in the area, Eureka Springs had little to offer businessmen. However, the one thing it certainly had was its hot springs. The act of going to a natural spring to take a bath has been around since the time of the Romans, but no one perfected the bath holiday quite as well as the Victorians. From the 1880s to around the 1920s, towns with hot springs flourished. Eureka Springs, with its many natural springs became one of the state’s great tourist destinations. Much of the town’s founding is surrounded by legend. Many of the early guidebooks published in the early 1880s suggested that the town was the site of the legendary Fountain of Youth. Most early guidebooks tell of an old man named Judge Saunders (or Sanders, in some retellings) who came to Eureka Springs in 1880 to soothe a leg ailment at the behest of a doctor friend. During his stay at Eureka Springs, Judge Saunders claimed that not only did it heal his leg, but the waters helped him lose 40 pounds, and, as he wrote, “portions of my hair changed from a yellowish white to black, its original color. The color of the hair then grown was not changed, but a new crop grew out from the scalp, of the color of my hair in my younger days.” So, the waters seemed to also cure baldness. What more could anyone want? Well, it seems that the waters also could cure a number of ailments, or so the area’s doctors claimed. Some of the illnesses claimed to be cured by Eureka Springs’ spas were blindness, paralysis, “liver complaints,” asthma, and chronic constipation. And there were plenty of doctors who were happy to publish testimonials from themselves and patients about the truth of the cure rumors. Pretty soon, newspapers throughout the midwestern United States published advertisements hoping to draw visitors to the new town. By the mid-1880s, newspapers in Texas advertised the town as the premiere destination for Texans. This was the environment in which some enterprising businessmen led by former Governor Powell Clayton gathered in the town in 1886 to plan construction of a grand hotel. The new hotel came with a staggering price tag: $250,000, over five million dollars in 2016 money. And it was in this period during its construction that the hotel gained its first spectral tenant, according to legend, when an Irish bricklayer fell to his death. Since then, the bricklayer has enjoyed steady employment as the grandfather of all of the Crescent’s ghosts, enjoying the hotel’s finery for over 130 years. And what a grand hotel it was! The building’s exterior was built using white stone hauled by mule from the White River. The hotel grew to three stories with elaborate Gothic spires and towers. Inside, the hotel lobby was awash in fine marble. The building also was one of the few in the state to boast of having electric lights. But this was the Gilded Age, and soon the fortunes of the town took a hit. The bathing fad seemed to end as the nineteenth century drew to a close. Most bathers found other towns such as Hot Springs more accessible, and the hotel struggled to keep occupants. By 1906, the hotel only opened during the summer, and even then it struggled to make ends meet. And here is where the hotel enters into its second life as a women’s college. The rules for the students seem very quaint. Once arriving at the new college, young women were allowed to bring with them a handful of items including a Bible, raincoat, napkin ring, and umbrella. Beyond these essentials, students were required to get permission from the college president to buy additional necessities. Of course, clothing was a standard uniform of a dark blue waistcoat over a modest white dress. The young women also were required to give the president a list of correspondents, and any additional correspondents had to be approved by the president. No doubt such restrictions were required to protect the sanctity of young womanhood, and that protection came with yearly tuition of $400. According to legend, at least one of the students still lives there tuition free. The story goes that the young woman was either pushed or fell from a railing to the grounds below. She has been seen by modern guests walking the grounds in her chaste uniform. Over the years, however, the college struggled to stay afloat and it closed its doors in 1934. Then a medical huckster named Norman Baker came to town. Baker already had a sketchy past. The flamboyant Baker was widely known to dress in purple shirts and drive a large purple car while urging people to buy his cancer “cures”. He based his operations in the early 1930s in Muscatine, Iowa, where he built an empire hocking his cancer antidotes. He established a string of hospitals throughout the Midwest and ran several radio stations all advertising his wares. Of course, claiming to be able to cure cancer gets attention. And beyond the hopeful people rushing to be healed, he also drew the ire of the American Medical Association who criticized him openly and often. After studying his elixir, the AMA announced that it contained no more than watermelon seeds, clover seeds, corn silk, and water. Soon a grand jury in Muscatine indicted him for practicing medicine without a license and his empire began to crumble. In 1938, Baker came to Arkansas, settling in Eureka Springs, buying the vacant hotel for a song. Claiming to be a cancer expert, he opened the hotel as the Baker Hospital. Here, he doubled down on his claims, now not only claiming to cure cancer, but to “cure all known ailments.” According to testimony from his later trial for mail fraud, Baker was known to hire healthy people to sit on the balcony and pose as patients who had been cured. And word of mouth got around. Hundreds of cancer stricken people came to the “hospital” hoping to be cured. And hundreds died waiting for their cure. It was estimated that Baker raked in as much as four million dollars at the “hospital,” all from the most desperate people in desperate circumstances. It was not long before Baker’s claims came to the attention of Arkansas’s medical establishment and the federal government. On September 22, 1939, a federal court indicted Baker for making dubious claims through the mail. The indictment charged that Baker claimed that “remedies and treatments recommended and used by the members of the American Medical Association would not and could not in any event cure cancer but that Norman Baker had during the year 1929 discovered and perfected a sure cure for cancer.” He was convicted in federal court and served four years in federal prison. He would get out in 1945 and leave for Florida where he would continue his bogus medical practice. Ironically, Baker would later die from cancer. But, his time in Eureka Springs left the most lasting mark on the Crescent Hotel. It is said by guests that many of those patients are still there, waiting to be rid of disease. Some people have even seen Baker himself, bedecked with purple tie, walking the halls of the hotel. A nurse has been spotted wheeling a cart down the halls. And then there are the ghostly patients, many of them occupying the basement, which during Baker’s time operated as a morgue. Today, the Crescent Hotel is one of the most popular tourist attractions in the town. Visitors tour the hotel and admire its architecture and are amazed at the hotel’s strange history. Many come specifically hoping to spot a spectral resident walking the hotel’s corridors. But before one goes to the hotel hoping to be scared, one should know that not all of the Crescent’s permanent occupants are scary. The Irish bricklayer has been known to have a sense of whimsy. He prefers to stay in room 219, where he has been known to pull pranks on guests, such as turning on the air conditioner full blast during the winter, and cranking up the heater during the hottest parts of summer. Another ghost, Theodora, was a patient during the hotel’s “hospital” period. She has been known to neatly fold guests’ clothing in room 419. These rooms are by far the most popular of the hotel’s accommodations and the waiting period to stay in them can be as long as a month. The current owners of the hotel do not shy away from the hotel’s supposed haunted past. They are glad to offer ghost tours of the hotel. Nevertheless, whether or not one tends to believe in ghosts, it is no doubt that the hotel’s strange history is enough to continue to draw visitors for years to come. The Hawken Rifle: Its Place in History, by Charles E. Hanson, Jr. The Flags of the Confederacy, by Devereaux D. Cannon, Jr.
John Lee Webb: The Man and His Legacy, Cheryl L. Batts, Janis F. Kearney, Patricia W. McGraw, Ph.D.
Presenting Archaeology to the Public: Digging for Truths, edited by John H. Jameson, Jr.
Indians, Settlers, and Slaves in a Frontier Exchange Economy: The Lower Mississippi Valley Before 1783, by Daniel H. Usner, Jr. In Pursuit of Reason: The Life of Thomas Jefferson, by Noble E. Cunningham, Jr.
Foster City Army Retirement, 0.01 cu ft.
Mary Leah Willson was born December 30, 1889, at Dardanelle, Yell County, Arkansas, the daughter of James A. and Minnie McElwee Willson. She was the granddaughter of Dr. Curtis Reed Willson, a surgeon in the Confederate Army. She graduated from Ouachita Baptist College and later attended the University of Arkansas at Fayetteville. In 1915, she married Opal Noils Harkey, a merchant and banker with businesses in Ola, Plainview, and Dardanelle, Arkansas. In 1937, the Harkeys moved to Conway where they operated a number of retail businesses, including a women’s clothing store. Opal died January 9, 1940. In 1949, Mrs. Harkey became the director of the Arkansas Confederate Home at Sweet Home. In 1953, she supervised the relocation of the home’s inmates to a new building on the campus of the Arkansas School for the Deaf in Little Rock, Arkansas. She also oversaw the closing of the home in 1963. Mrs. Harkey's brother–in–law, Judge Clarence Price Newton (1879-1958), served as the second superintendent of the Confederate Home from 1913 to 1918. Mary Willson Harkey was a member of many professional and patriotic organizations including the United Daughters of Confederacy, the Daughters of the American Revolution, the Business and Professional Women’s Club, and the Welfare Forum. She died in Little Rock on April 3, 1979, and was buried next to her husband in the Sandlin Cemetery at Ola, Arkansas. The couple had two children, Virginia Harkey Hilton and James Willson Harkey. This collection contains photographs, newsclippings, business records, correspondence, publications, and scrapbooks from the personal and professional files of Mary Leah Harkey. It contains information related to her tenure as superintendent of the Arkansas Confederate Home in Little Rock, Arkansas. 24. 1916 September: "Confederate Veteran"
25. 1931: Souvenir program, "Forty-first United Confederate Veterans Reunion"
27. 1899: "The Complete Medical Packet–Formulary"
28. 1911: "Speech of Senator Jeff Davis Delivered at Morrilton, Arkansas"
29. 1913: "Jeff Davis Governor and U.S. Senator: His Life and Speeches"
30. 1951: "The Golden Book of Favorite Songs"
31. 1945: "American Red Cross First Aid Textbook"
Today, Hulbert is an old section of town in West Memphis, but one hundred years ago, it was its own little community. In 1909, Brothers H. Rupple Dabbs and E.O. Dabbs built the first general store in Hulbert. Unfortunately, the little wooden structure could not stand up against the spring flood waters of 1912. Determined to stay in Hulbert, the Dabbs brothers rebuilt with the aid of a Little Rock architect. By the end of 1912, a new brick Dabbs Brothers General Store opened on higher ground. Because the structure was lauded as permanent, it became a host to the community. A school met in the store until the one-room school was built across the railroad tracks. It served as the first Post Office from 1923-1948. The Dabbs brothers were deeply invested in Hulbert. In addition to serving as merchants, they owned a cooperage company, lent money to residents to purchase land and homes, and E.O. Dabbs held elected offices, including Justice of the Peace and County Coroner. The original brick building is still standing in West Memphis and today functions as an office for Pat Kelley Magruder Architects. Rupple sold the store to Pat Magruder, Sr. in 1979. The new owners placed the building on the National Register of Historic Places and expertly renovated the space, preserving the majority of the original structure and details. Along with the papers and books, a small box of store inventory was donated. These items included a pair of pants, buttons, sew-on snaps, cookware hole repair, bobby pins, and embroidery patterns. Because these items added no value to the collection, they were removed. Wilson-Ward Company et.al. v Young et.al. In 2003, the United States celebrated the Louisiana Purchase's Bicentennial. From 1998 through 2003, the Arkansas Secretary of State's office planned, developed, and promoted it. They carried out statewide and local programs and activities suitable for the bicentennial observance, ensuring a positive legacy that had long-term public benefits. This collection contains the records and research from the Arkansas Secretary of State's office for the Louisiana Purchase Bicentennial celebration in 2003. AETN: 2003 February 22, "It started here: early Arkansas and the Louisiana Purchase"
Arkansas Secretary of State Sharon Priest "Building forever: the history of the Arkansas State Capitol"
AETN: 2003 March 5, "it started here: early Arkansas and the Louisiana Purchase"
2. Supervising professional staff, volunteers and interns. 5. Engaging in outreach activities. 7. Responsible for the preservation and security of the collections. 8. Performs related responsibilities as required or assigned. Working Relationships: The Archival Manager has regular contact with agency staff, other state agencies, historical organizations, libraries, and the general public. Knowledge of historical archival management. Knowledge of archival processing and storage methods and procedures. Knowledge of equipment used in archival processing, storage, and use. Ability to supervise a technical and administrative support staff in an archival operation. Ability to develop policies and procedures and compile reports related to an archival operation. Ability to communicate with donors concerning care and use of collections. Minimum Qualifications (Applicants must meet or exceed): The formal education equivalent of a bachelor’s degree in history or related field; plus three years of experience in a museum or archival operation, or related area, including one year in a supervisory capacity. Special Requirements: A valid drivers’ license and pre-employment criminal background check are required. This position is subject to drug screening. This position offers a full benefit package including paid holidays, annual and sick leave, health and life insurance and retirement. To find out more about the Arkansas State Archives division of the Department of Arkansas Heritage, please visit www.ark-ives.com. 8. Serves as agency liaison to the SARA Foundation Board. 9. Performs related responsibilities as required or assigned. Class Summary: The Archival Assistant reports to the Archival Manager and serves as the agency's only paper conservator, which is necessary to care for the agency's collections and monitoring of facility environmental conditions. The position is governed by state and federal laws and agency policy. 1. Monitoring archival facility environmental conditions and reporting issues of concern to State Historian. 2. Supervising the work of the conservation lab, which includes the training and oversight of interns and volunteers. 4. Makes recommendations for/or mediating preservation concerns with new or existing archival materials. 5. Conducting preservation, restoration and conservation tasks (e.g., repairs, cleaning, washing, encapsulation, mending, creating special enclosures, deacidification) according to archival best practices and standards. 6. Consulting with other state agencies, museums, historical organizations, libraries and other entities on conservation/preservation issues. 7. Providing preservation workshops for state agencies and the general public. 8. Developing and maintaining agency's disaster preparedness plan. 9. Advising and training agency staff on basic preservation methods and techniques. 10. Performs related responsibilities as required or assigned. Working Relationships: The Archival Assistant has regular contact with staff, other state agencies, museums, historical organizations, libraries, volunteers and the general public. Minimum Qualifications (Applicants must meet or exceed): The formal equivalent of a high school diploma; plus two years of specialized training in library science, history or a related field. PREFERRED: Bachelor's degree in history, art, humanities, or related field. Special Requirements: The formal equivalent of a high school diploma; plus two years of specialized training in library science, history or a related field. The Arkansas State Archives will be hosting a symposium from 9 a.m. until 2 p.m. on Sat., Oct. 29, at the North Little Rock Heritage Center in North Little Rock. The symposium’s theme, “Using Archival Records to Preserve Historic Structures,” will feature speakers Rachel Silva, Callie Williams, Sandra Taylor Smith, and Ann Clements and will focus on using archival records for research in historic preservation. The seminar is free but registration is required. Check-in will begin at 8:30 a.m. Teachers can earn up to four professional development hours through attendance. Registration is limited and deadline for registration will be Oct. 25, so be sure to make reservations soon. Lunch will be provided. The Arkansas State Archives is an agency under the Department of Arkansas Heritage and is responsible for collecting and maintaining the largest collection of historical materials on Arkansas in the world. The State Archives has two branch locations; the Northeast Arkansas Regional Archives is located in Powhatan and the Southwest Arkansas Regional Archives is located in Washington. Other agencies under the Department of Arkansas Heritage include the Arkansas Historic Preservation Program, the Arkansas Arts Council, Delta Cultural Center in Helena, the Old State House Museum, the Arkansas Natural Heritage Commission, the Mosaic Templars Cultural Center, and the Historic Arkansas Museum. This project is funded in part by a grant from the Arkansas Humanities Council and the National Endowment for the Humanities. The Shillcutt family arrived in Little Rock in 1847, and Emsley C. Shillcutt was the first to operate a saddlery and harness-making business in the city. Shillcutt Drug Company at 1001 West Markham was owned by Rupert E. Shillcutt, Sr. (son of E.C. ), beginning in 1895. He was among the earliest licensed druggists in the state, holding license number fifty-one. In 1970, June Bales Shillcutt, son of R.E. Shillcutt, Sr., was killed during a robbery of the store. The Shillcutt family operated the store until the early 1970s. The Shillcutt Drug Company was one of Little Rock's few remaining downtown area "neighborhood" drug stores at the time of its closing. This collection includes financial records of the Shillcutt Drug Company from 1902 to 1959.